KANKAKEE, Ill. (AP) — A man who told police he was upset that a landlord didn't return his security deposit has pleaded guilty to setting a fire that killed two boys in Illinois. BRADLEY, Ill. (AP) — Science class isn't going to become cooler in a Kankakee County school district. BRADLEY, Ill. (AP) — If kids could vote, a ballot proposal next week in Kankakee County probably would win in a breeze. 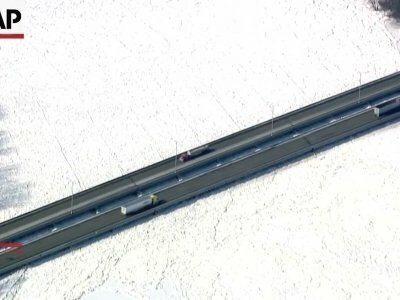 WILMINGTON, Ill. (AP) — An ice jams is breaking up along the Kankakee River in northeastern Illinois and forcing evacuations. 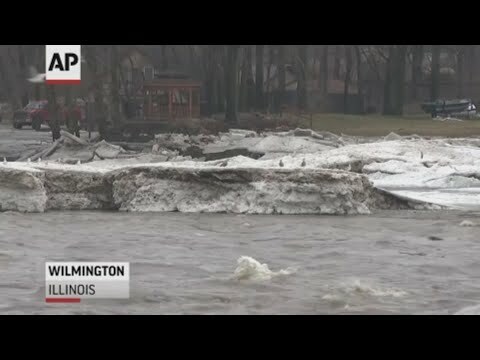 WILMINGTON, Ill. (AP) — A seven-mile ice jam on the Kankakee River could cause flash flooding as warmer temperatures and possible rain move into northern Illinois. CROWN POINT, Ind. (AP) — A judge says the father of two Indiana boys who drowned in a river can get mental health and drug treatment while in custody, rather than be released to participate in a drug treatment program. Lake County Judge Samuel Cappas on Wednesday denied a request for lower bond on behalf of 34-year-old Eric Patillo, of Thayer, while he awaits trial on charges of neglect of a dependent resulting in death. URBANA, Ill. (AP) — A 29-year-old man has been sentenced to 15 years in prison for serving as the getaway driver in an armed robbery of a central Illinois cellphone store. A Tuesday statement from Springfield's U.S. attorney's office says a federal judge in Urbana also ordered that Randy Williams of Kankakee pay about $32,000 in restitution to the Champaign Sprint Store. The sentence was imposed Monday. SPRINGFIELD, Ill. (AP) — State officials have released more than $14 million for improvements to state parks. KANKAKEE, Ill. (AP) — An Illinois county has approved a memorial honoring three former governors from Kankakee, including convicted ex-Gov. George Ryan. CROWN POINT, Ind. (AP) — The father of two Indiana boys who drowned in a river has pleaded not guilty to two counts of neglect of a dependent resulting in death. HAMMOND, Ind. (AP) — The father of two Indiana boys who drowned in a river has been charged with felony neglect in their deaths after allegedly telling police he had used heroin before taking his sons to the waterway. Eric J. Patillo, 34, was indicted Thursday on two counts of neglect of a dependent resulting in death. PINKHAM NOTCH, N.H. (AP) — Crews have come to the aid of a father and daughter stranded on a hike to the summit of Mount Washington, one that they first completed 40 years ago. Fish and Game conservation officers said 77-year-old Carl Bergeson, of Ocala, Florida, and his daughter, 51-year-old Krista Brousse, of Kankakee, Illinois, attempted the Tuckerman Ravine Trail hike up the highest peak in the northeastern United States on Wednesday. KANKAKEE, Ill. (AP) — Two county jails in Illinois set a record for receiving $959,000 in federal revenue. Kankakee County's jails in May broke its previous 2013 record when it received $957,000 in outside inmate bed rental money, the Daily Journal reported. Nearly all of the money comes from federal agencies. Kankakee County gets $80 daily for each inmate from the feds and $72 from Cook. KANKAKEE, Ill. (AP) — A baby eastern screen owl that fell from its nest twice is getting some recuperative assistance. Daniel Allen Klimas, 68, of Henderson, Nev., and formerly of Kankakee, passed away April 5, 2018, at his home in Henderson, Nev., after an illness that had lasted several months. A celebration of life service took place April 13 in Henderson, Nev., per his wishes. He was born Jan. 15, 1950, in Kankakee, the son of Chester and Bernice (Jepsen) Klimas. Daniel had retired as the senior quality engineer at National Security Technologies. Deacon Robert L. Taylor, 67, of Memphis, Tenn., and formerly of Sun River Terrace, passed away peacefully on April 11, 2018, at his home. A memorial service in celebration of his life will be at 11 a.m. on Saturday, April 28, at Pleasant Grove Baptist Church, 487 N. Fairmont Ave., Kankakee. His childhood friend, the Rev. Earnest Rucker, will officiate. Robert was born on Jan. 24, 1951, in Chicago, the son of the Rev. Casey Wade Jr. and Doris Wade. Dale J. Brinkman, 63, of St. Anne, passed away Saturday (April 21, 2018) at Presence St. Mary’s Hospital in Kankakee. He was born July 12, 1954, in Kankakee, the son of Donald and Elizabeth Uehlein Brinkman. Dale was a longtime farmer in the St. Anne area. He also worked at American Spring Wire in Kankakee. A graduate of St. Anne High School, he was a member of Future Farmers of America. Dale was a Boy Scout. He enjoyed hunting and trapping and bird-watching. Renae Christine Culp, 23, of Kankakee, passed away April 12, 2018, at her home. She was born Aug. 17, 1994, in Kankakee. Renae loved gardening, beekeeping and was an avid reader. KANKAKEE — Kankakee is the newest location for the expanding Berkot's Super Foods grocery chain. Berkot's ownership wrapped up the final details on the purchase of the 22,950-square-foot former Mario's Market store at 1557 W. Court St., on the city's west side. The store had been owned by the Mario Buono family since 1995. The family had also operated stores in Herscher and Limestone Township. Those stores had previously closed. The store will be the 16th for the Berkot's grocery. KANKAKEE — Students sat together, kneading and rolling out dough before pressing cookie cutters of various shapes. Some chose stars. Some chose hearts. Their conversations revolved around how much dogs would enjoy the biscuits they were making and how much they looked forward to making money for their upcoming trip to Chicago. Anne (Borschnack) Flanagan, formerly of Herscher, Wilmington and Crete, passed away recently. She was born in 1934 in Herscher, the daughter of Fred and Teresa Borschnack. Her parents preceded her in death. Anne graduated from Wilmington High School and then went on to attend and graduate from St. Mary’s School of Nursing in Kankakee. Anne was a nurse in Kankakee and Denver, Colo.
Kathy Ann Deatherage, 57, of Momence, passed away Wednesday (April 11, 2018) at Presence St. Joseph Hospital in Joliet. She was born June 22, 1960, in Kankakee, the daughter of Russell and JoAnn Anderson Hartman. Kathy married Brian Deatherage on Feb. 15, 1986, in Kankakee. Carol Ann Fisher-Sifrit, 57, of Kankakee, passed away Monday (April 23, 2018) at her home. She was born Sept. 3, 1960, in Anna, the daughter of Paul and Betty Jean Johnson Fisher. Carol was the dietary director at Heritage Health in Dwight. She loved riding her motorcycle and spending time with her kids and grandkids. She also enjoyed boating and camping. Getting Ready for Kindergarten — Read to the dogs and celebrate furry friends, 6:30 p.m. For children ages 3-5. Limestone Library. Children must be in the GRFK program in order to participate. Sign up is easy. Register 815-939-1696. Soul Collections Book Discussion, 6:30 p.m. Kankakee Library. April’s book is “Dear Martin,” written by Nic Stone. Pick up a copy in circulation. Group meets last Thursday of each month. That the students of the Pledge for Life Partnership Youth Advisory Council want you to know. Not everyone is smoking, drinking or taking prescription drugs. In fact, the 2016 Illinois Youth Survey showed only 23 percent of sophomores and 37 percent of seniors in Kankakee County said they had alcohol — the most abused substance — in the past 30 days. Despite that, 68 percent of students thought their peers were drinking at higher rates. Women in Networking, an affiliate of the Kankakee County Chamber of Commerce, will hold its next annual luncheon May 10 at the Kankakee Public Library, fourth-floor atrium in Kankakee. Kankakee police arrested Christopher J. Pulley, 19, of Kankakee, for battery and disorderly conduct on April 20. According to police, Pulley is a student at Avis Huff in Kankakee. He walked into a teacher’s room and was asked to leave. Pulley became upset and pushed the teacher and punched him in the face four or five times. The teacher was able to push Pulley out of the room and close and lock the door. A judge set his bond at $5,000. Kankakee Valley Garden Club will meet at 7 p.m. Thursday at the Bird Park Fieldhouse in Kankakee. The program is by Becky Williams on spring flower arrangements. Hosting are Margaret O’Reilly, Nancy Prince and Sue Gibson. For more information, call Teri Doehring at 815-939-0314 or Donna Tanner at 815-426-2918.Bonfield Garden Club will meet at 7 p.m. May 7 at the home of Liz Rittenbacher. For more information, call Rita West at 815-933-7254. KANKAKEE — The murder trial of Javonta Davis was delayed after Judge Clark Erickson granted the defense’s motion for a continuance on Monday. Davis is charged with the drug-induced homicide of a man in November 2016. Officials are declining to name the victim in this case. The trial now is set to begin Aug. 20. Davis’ attorney, Bart Beals, said prosecutors told him Monday they had received additional information they were not aware of from investigators. The Kankakee Public Library will be hosting this month's Soul Collections, from 6:30-7:30 p.m. Thursday in the third floor meeting room of the library. This month's selection is entitled "Dear Martin," by author Nic Stone. Stone joins industry giants Walter Dean Myers and Jason Reynolds as she boldly tackles American race relations. KANKAKEE — It’s 11:30 a.m. on a Friday afternoon, an entire day before Grace Christian Academy has Senior Day scheduled against Berean Christian. But head coach and defacto grounds crew leader Jeff Cross has already spent almost four hours on the school's baseball field — or as he likes to say, in his office. KANKAKEE — Nicholas D. Gryczewski, of Watseka, was charged with domestic battery and disorderly conduct for the April 13 attack of his ex-girlfriend while she worked at Jewel in Bourbonnais. The 22-year-old Gryczewski’s bond was set at $35,000 by Judge Clark Erickson on Friday. According to Prosecutor Jonathan Watson, Gryczewski and the victim dated four years before she ended the relationship recently. Gryczewski entered the store and attacked the victim as she was working as a cashier. The two local candidates for state representative have been largely quiet since the primary election last month. But that probably won’t last. In November, Rep. Lindsay Parkhurst, R-Kankakee, will face former Rep. Lisa Dugan, D-Bradley, in the Illinois House 79th District, which is seen as a battleground. Tamaris R. Barnett, 26, of Kankakee, passed away on Friday (April 20, 2018) at home. Funeral arrangements are pending at Jones Funeral Home in Kankakee. Miranda J. Day, 61, of Momence, passed on Saturday (April 21, 2018) at Riverside Medical Center in Kankakee. Funeral arrangements are pending at Jones Funeral Home in Kankakee. KANKAKEE — The murder trial of Javonta Davis was set to start today at the Kankakee County Courthouse. The 25-year-old Davis is charged for allegedly selling fentanyl-laced heroin that killed at least one person in November 2016. He was arrested April 2017 after being indicted by a Kankakee County grand jury. On Friday, a motion to continue by Davis’ attorney Bart Beals was denied by Judge Clark Erickson.